Dates: 13th August, 2019 – 23rd August, 2019. High School Visits: 2-4 (per city). Tour Liaison: To accompany participants across the tour. Domestic Travel (Economy Class) within India. Hotel Accommodations (Five Star Properties). International Flights from your location to India. Material or Merchandise to be distributed to students will need to be shipped to our Mumbai office at least 30 days prior to Tour commencement. The shipping charges will be borne by the University. Dates: 03rd September, 2019 – 05th September, 2019. Flex Price does not apply. Campus Connect is an incredible organization that is well-connected throughout India with both undergraduate and graduate students. They are accustomed to working with both Indian and Western cultures and they know how to bridge the gap. Their personalization, professionalism, and attention to detail are second to none. I would highly recommend any university work with Campus Connect! Campus Connect was as very productive and effective tour, which has provided to bridge the gap and build a network with the Internationals schools across the urban cities in India Laureate Design Universities has been able to showcase itself in some of the good quality IB schools through this tour and build a relation with them for a long term. Thank you Campus Connect. This is my 3rd recruiting trip to India, but my 1st with Campus Connect. We will be staying with the Campus Connect group. They took care of all details related to our travel in India, gave us important insights into economic, cultural, and political situation in India, and treated us like one of their own family members. The high school visits were great and I know they will continue to strive for excellence in their future appointments with IB schools. After the tour, Campus Connect set up individual Skype meetings with all of us to give suggestions for follow-up needed to prospective students and counselors we met during our high school visits. I would highly recommend Campus Connect to anyone interested in recruiting in India. I hope to see you on the next Campus Connect Recruitment Tour. What makes them unique is the emphasis on relationship-building. We were actually able to engage in meaningful conversations with the very staff whose knowledge and expertise is both invaluable for own recruitment strategies and highly impactful on their students’ academic paths. This type of approach will help us to nurture long-term partnerships in India and keep us coming back to Campus Connect! Dear Campus Connect team, I would like to sincerely thank you for all of your hard work and making this trip so special for Kings Education and me. 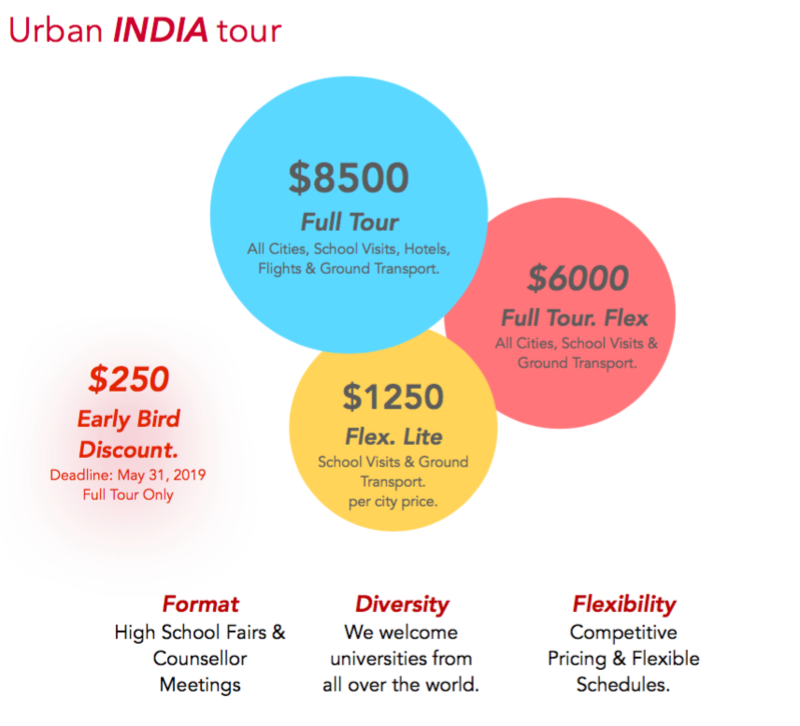 I have travelled to India before, but never have I felt so cared for, and the comprehensiveness of the schedule was very impressive, as we were able to accomplish so many amazing things in only two weeks. More specifically, we were astonishingly able to visit 22 international schools in these 11 working days, and each visit was carefully coordinated, with adequate transportation to and from the events always provided and the schools ready to receive us and conduct the fairs in a timely manner. Last but not least, and I really mean this, I feel as if I have returned home with new friends, and that to me is probably the most important thing because good work comes only as a result of great life experiences! If anyone would like to speak with me personally about my great adventure with Campus Connect, I would be more than happy to have a conversation. Thanks again! Copyright © 2016 Campus Connect. All Rights Reserved.